DescriptionTom Batiuk was a junior high school art teacher in Elyria, Ohio, when he created a comic panel aimed at teens for the Elyria Chronicle-Telegram. 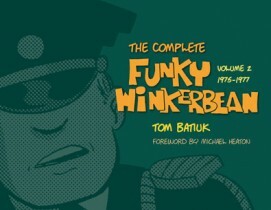 That panel was the precursor to what became Batiuk’s award-winning comic strip Funky Winkerbean. 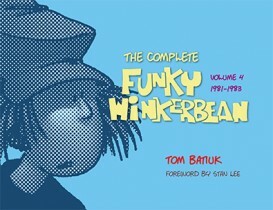 Since its debut on March 27, 1972, Funky Winkerbean has chronicled the lives of a group of students from the fictitious Westview High School. 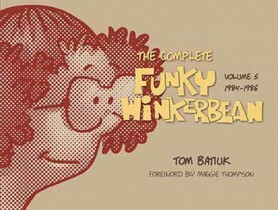 This volume, which presents the strip’s first three years, introduces the strip’s title character, Funky, and his friends Crazy Harry Klinghorn, Bull Bushka, Livinia Swenson, Les Moore, Holly Budd, and Roland Mathews. Principal Burch, counselor Fred Fairgood, and band director Harry L. Dinkle also make their first appearances. Funky fans will relive Les’s misadventures in gym class and his unintentional attendance at the homecoming dance as he remains stuck on a climbing rope high above the gymnasium floor. They will remember Crazy Harry’s ability to play pizzas like records and his air guitar virtuosity, and majorette Holly who never removed her uniform. They will recall the school’s winless football team, and Harry Dinkle’s attempts to win the Battle of the Bands despite the contest always coinciding with a natural disaster. 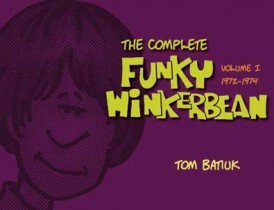 Volume 1 contains a charming autobiographical introduction by Tom Batiuk that shares his early attempts at cartooning, discusses his teaching career, and explains the genesis of Funky. Subsequent volumes will each contain three years of Funky comic strips and will be published annually. Batiuk has been recognized for his humorous and entertaining portrayals of the students and staff at Westview and acclaimed for his sensitive treatment of social and educational issues. Author Tom Batiuk is a graduate of Kent State University. His Funky Winkerbean and Crankshaft comic strips are carried in more than 600 papers worldwide with an audience of more than sixty million readers. He was honored as a finalist by the Pulitzer Board in 2008 for a sequence in Funky Winkerbean that portrayed character Lisa Moore’s poignant battle with breast cancer. InterviewsWatch an interview with Tom on CBS This Morning. Watch an interview with Tom on WVIZ/Idiastream’s Applause (it begins at 12:54).